Taste of Douglasville 2018 packed downtown Douglasville last weekend! Douglasville, Georgia – Saturday, May 19th brought the threat of thunderstorms but ended up bringing a beautiful sunny day which helped make a supremely successful Taste of Douglasville Fundraiser for the Arts Council. All categories of activities met or exceeded the Cultural Arts Council’s goals – number of restaurants, sponsors, performers, Arts & Craft booths, Better Living booths, Kid’s Korner booths and Festival Roamers. It was an active, happy and well-fed crowd celebrating downtown Douglasville! 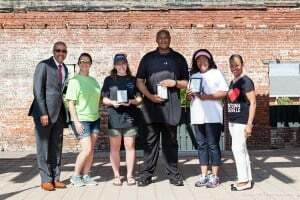 Four awards were presented to food vendors that were judged by Chef’s from Gordon Food Services. Best Entrée went to Carrabba’s Italian Grill for their delectable Chicken Spendini, Best Dessert went to the Farmer’s Table for their Coconut Cake, and Best Presentation went to Cupcakes by D’signz. 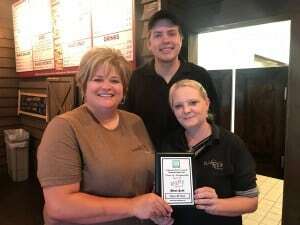 The most contested prize this year, for Most Sold, goes to Shane’s Rib Shack! O’Neal Plaza stage was filled with African drumming to dancing. The Kids Korner in the alley between Broad and Church Street was filled with delighted youngsters, the Douglasville Police Department’s K-9 demonstration thrilled the crowd, and there were browsing and shopping opportunities aplenty with jewelry, candles, cellphones, and much more. Services to consider for the future, from realtors to political leaders, from resorts to travel agents, insurance to home repair – they were all represented. For 2018, Taste of Douglasville is a wrap to a very successful production. For the Cultural Arts Council, Taste of Douglasville is both a major fund-raiser and a community festival. The Cultural Arts Council of Douglasville/ Douglas County, located at 8652 Campbellton Street in historic downtown Douglasville, Georgia, is open Mondays through Fridays, 9 am to 5 pm. For directions or more information, visit www.artsdouglas.org or contact the Cultural Arts Council at 770-949-2787.